The title of this post, of course, comes from the X-Files. It's also been commonly referenced when describing White House press briefings with Sarah Sanders at the podium, as it was in this Forbes article. "The truth is out there." That's the tagline of the new TV show The X-Files, and it's a good thing the show is coming back in 2018, because its premise couldn't be more timely. She reiterated that again today, in her press briefing, as many times as she could, and with only limited success. Q: ...I want to ask about the videos that the president tweeted yesterday. Firstly, does the president feel that he has an obligation to ensure that the information that he shares on his Twitter feed to millions of people is accurate? A. I think the president feels that bringing up important issues of our time, like extreme violence and terrorism, are important to do. That was what he was doing in that process, and I think he's going to continue to do that in a number of venues whether it's through speeches, whether it's through Twitter or other social media platforms. That went well, don't you think? Here's part two. Q: But does he understand, though, that sharing those videos might incite violence against Muslims? And does he understand that he's elevated a fringe political group that many people outside of Britain didn't even know about until he tweeted? A: Look, I think what he's done is elevate the conversation to talk about a real issue and a real threat, and that's extreme violence and extreme terrorism, something that we know to be very real and something the president feels strongly about talking about, and bringing up and making sure is an issue every single day, that we're looking at the best ways to protect Americans. Whoa. He's going to be spreading lies and hate every single day, officially? Someone tell Twitter and Facebook, so his accounts can be suspended! And not for nothing, but this particular conversation has not been 'elevated' because no one's talking about terrorism as result of the president's tweets. They're talking about how embarrassing it was, to America and to our allies; they're talking about the fact that one of the videos was a fake and the other two were unverified; they're talking about how none of them happened in Britain, and not in the US, for that matter. And people are talking about the reaction from Prime Minister Theresa May and others, including this one. And from someone else named Theresa May Scrivener who was tagged (instead of the Prime Minister) in that follow up tweet. And how that tweet, which said that "we're doing fine" is the total opposite what he's been telling us all along, ever since his 'total ban on Muslims' speech. Sanders kept going, though, after giving us the 'elevate the conversation' line, with a straight face, no less. And she contradicted the "We're doing just fine!" remark in her response. 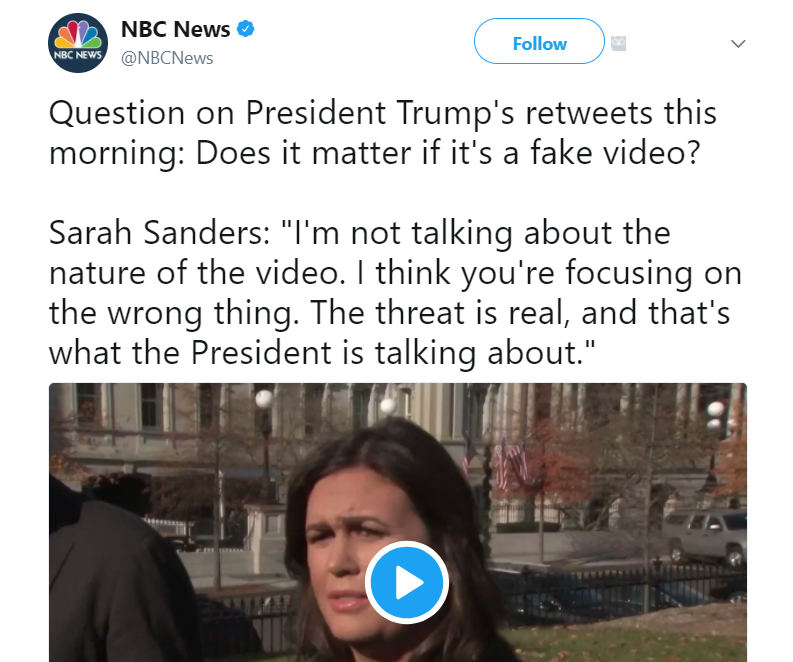 Q: On that point, Sarah, did the president, when he retweeted Jayda Fransen, know who she was? A: No, I don't believe so. But again, I think he knew that what the issues are, and that is that we have a real threat of extreme violence and terrorism, not just in this country, but across the globe, particularly in Europe. And that was the point he was making and I don't really have very much to add beyond that. He didn't even know who he was retweeting? And it didn't occur to him to look at the woman's profile? Well, actually, tonight you can't do that - her account has been suspended, but several people have posted a tweet Fransen supposedly sent which claimed that WWE wrestlers were Islamic hate preachers. I'm not posting it because I can't verify it was one she really sent - I guess that's just one more thing that differentiates me from the president. Evidence is how we discover the truth. Truth is the basis of both democracy and capitalism. The president uses a misleading, mislabeled video as evidence that Islam poses a grave threat to the United State, and his press secretary backs him up. The real threat to our democracy isn't a religion and its millions of followers but the Trump administration's abuse of power and utter contempt for the truth. Now, that is something we should "be making sure is an issue, every single day."